Easy Beach Booking is a website helping tourists visiting the French Riviera to make a reservation on a private beach in 2 minutes. Make your choice and discover our selection of gorgeous private beaches.among from St Tropez to Menton Visit www.easybeachbooking.com to book your private sunbed today, or call us on +338 99 49 04 44. Tan or Sun and Tan? Summer is drawing closer, the days are getting longer and the sun is beginning to blaze hotter day by day. 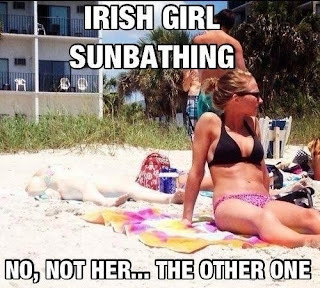 As the days get warmer, you find yourself wearing less and less and you become increasingly aware of how pasty and white your skin is after having been deprived of the sunshine over winter. Grab your bag, grab the suntan lotion and sunglasses, and get on this tanning business. While doing tanning beds, using spray tan or applying tan developer are easy quick fixes, where is the fun in using them? They can be expensive, they can give terrible results, they are proven to be bad for you skin, they rub off on your clothes and bed sheets, they are rarely realistic looking, and none of them involve any social atmosphere or actually enjoying the sunshine. Where is the fun factor?? Tanning bed prices range anywhere from 6 euros for just one session to up to 400 euros for membership.While a sunbed starts at a slightly more expensive price from 20 euros and up this is for a day of relaxation as opposed to 6 minutes in a box. As well you can get packages which include drinks and food too. The main question in regards to tanning that everyone asks is in regards to safety. So which is safer: sunbeds or tan beds? The answer is sunbeds. Tanning salons’ employees are trained to tell you that tan beds are “smarter” because they cannot tell you it is safer when it is not. Getting UV light directed into your pores while they are wide open is of course not safe but the selling point is the “control” you have over how much exposure to UV light you are getting. However this is slightly ridiculous as you are getting a much higher concentration of the wavelength of UVA which causes deeper damage to the skin than being in the sun wearing sunscreen. According to the skin cancer foundation frequent tanners using high pressure sunlamps may receive as much as 12 times the annual UVA dose compared to the dose from sun exposure, and are 74% more likely to develop melanoma than those who avoid tanning indoors. However still nearly 30 million Americans still buy into this business, according to the Skin Cancer Foundation; per year, knowing that it is not safe. However if you get yourself a sun bed you get to actually enjoy the atmosphere of being on the beach under the sun, you can go with friends, your skin gets a chance to absorb some vitamin D, you get to throw on that swimsuit that has been hibernating for the past few months, and for a bit extra you can get a drink and some nice food thrown in. What’s more is when you book a place you are 100% guaranteed a sunbed! Ditch the tan beds and book yourself a relaxing day at a private beach. Take time out with some friends, chill out and get a natural glow. Just don’t forget the sunscreen! Can the Dog Come Too? Summer is coming and so the holiday planning begins. It is a stressful thing to plan how you will relax, especially if you are planning on relaxing with your canine friend. For many, the beach bag contains sunglasses, a towel, swim gear, sun-cream and a bottle of water. For others their beloved dog is first on the list to be brought to the beach. At Easy Beach Booking we like to make life as easy as possible (as subtly hinted in our name), so we have decided to create a list of the beaches along the Cote d’Azur which will welcome your furry friends this summer. 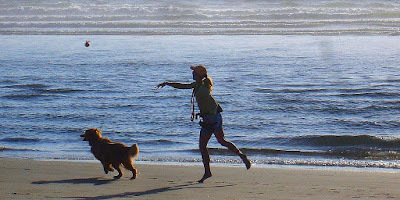 So yourself and herself, or himself, can take a walk along the long beautiful stretches of sand to exfoliate your paws and feet, respectively. That’s barking mad. 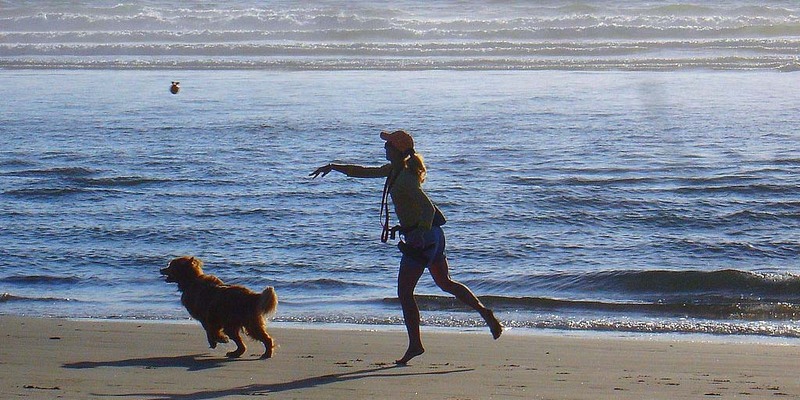 Along each of these beautiful beaches, unleash your inhibitions, but please keep your dog on a leash. Premièrement, if you plan on coming to the Côte d’Azur to spend some time amongst les Maralpins, which you really should, you and your dog will be welcomed, as long as there is a leash between the two of you, to none other than the lovely location of the Easy Booking Group office, in Ville-Franche sur Mer. Here the two of you can stroll along the end of the beautiful beach here. Should yourself and the hound get a bit peckish after your walk most of the restaurants are dog friendly here. Deuxiemement, if you are planning on staying in Nice and fancy taking a break along Promenade des Anglais, Port de Carras is ideal. Another lovely beach along the French Riveria to take the dog for a walk is Cagnes-sur-Mer from the horse track right up to the Villeneuve-Louebet. Other ideal locations include Cap d’Ail just on the beach at Pointe des Dounaiers; at Menton just at the Casino beach; Roquebrune-Cap-Martin just on the Golf-Bleu oust beach and Gorbin; and finally on the beach only of Villeneuve-Loubet at Vaugrenier. And so there you have it. 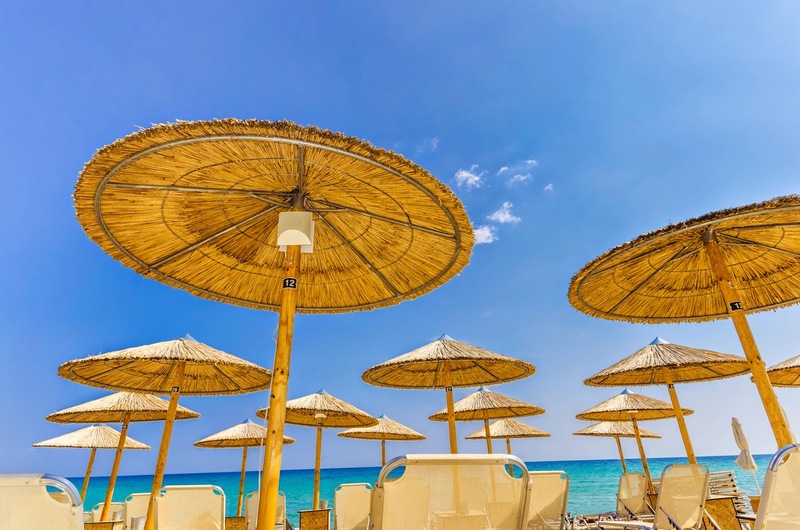 During your time along the Côte d’Azur, wherever you decide to visit, if you fancy some time alone on the beach, bark free, why not book a sunbed on a private beach. We are here to help when it comes to leisure and relaxation. We strongly believe the easy life. 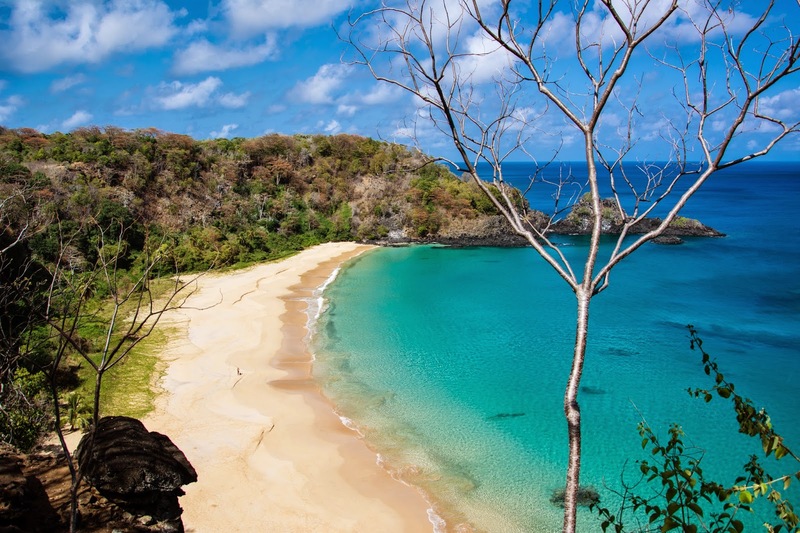 Baia do Sancho is famous for its vibrant crystalline water and pristine white sand. With it's astoundingly pretty bay, which is surrounded by towering cliffs covered by lush vegetation that's home to exotic wildlife, this beach is named one of the best in the world! Baia do Sancho est célèbre pour ses eaux cristallines dynamique et son sable blanc immaculé. Avec son étonnamment jolie baie, entourée par de hautes falaises couvertes d'une végétation luxuriante qui abrite une faune exotique, cette plage est l'une des meilleures au monde! This beach is simply stunning. Breathtaking water views and different shades of blues and turquoise. Starting with the color in the sky down to the water and then to the beach edge is like an amazing artistic picture. The sand is soft, clean with no seaweed. This is a beach taken right from your dreams. 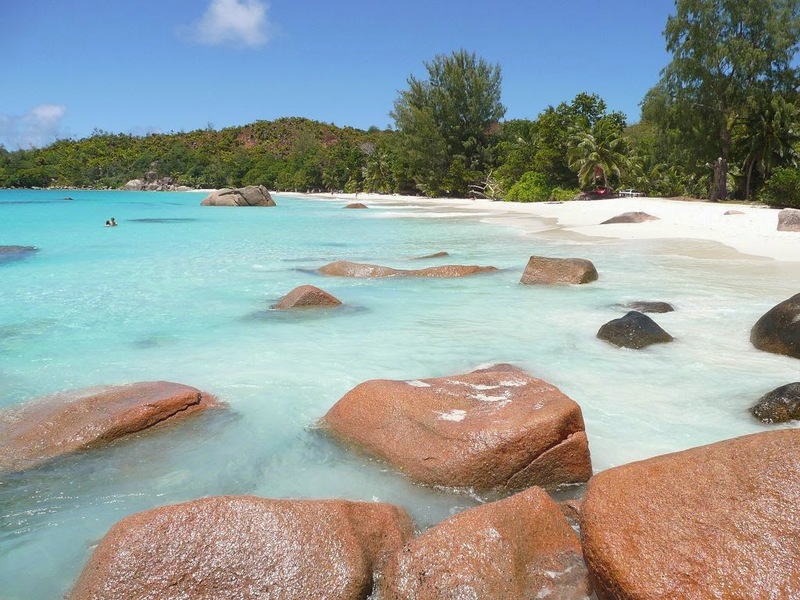 Cette plage est tout simplement magnifique. Une vue sur l'eau à couper le souffle et différentes nuances de bleu et de turquoise. Cela commence par la couleur dans le ciel jusqu'à l'eau, puis le bord de la plage. Comme une image artistique extraordinaire. Le sable est doux, propre, sans algues. C'est une plage venue tout droit de vos rêves. 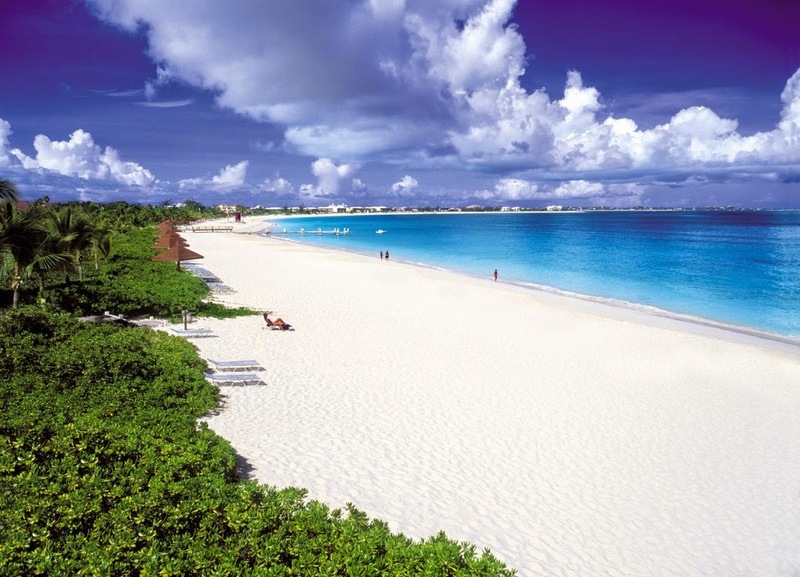 This peaceful beach is known for its tranquil atmosphere with amazing views and clear turquoise waters. Flamenco Beach is in a nearly waveless, sheltered cove during the late summer weeks. It is long, wide, surrounded by greenery, and only one or two buildings are near it. Fish swim right up to the edge of the water, which is waist deep for quite a stretch, and has at least 20 yards of crystal clear visibility underwater. Perfect for snorkelling! Cette plage tranquille est connue pour son atmosphère paisible avec une vue imprenable et des eaux turquoises. Flamenco Beach est presque sans vagues, dans une crique abritée pendant les semaines de fin d'été. Elle est longue, large, entourée de verdure, et seulement un ou deux bâtiments sont à proximité. Les poissons nagent jusqu'au bord de l'eau, qui arrive environ à la taille pendant au moins 20 mètres avec une cristalline parfaitement claire. Parfait pour la plongée! Truly crystal clear waters and white sand. This beach gets very hot, perfect for you who love to bake in the sun! You feel as if you are in your own piece of heaven in this beach - very popular for the locals who love to show it off, keeping it clean and free of any unwanted visitors. Des eaux cristallines et un sable blanc. Cette plage est très chaude, parfaite pour vous qui aimez cuire au soleil! Vous vous sentez comme si vous étiez dans votre propre morceau de paradis surcette plage - très populaire pour les habitants qui aiment la montrer, la garder propre et exempt de tous les visiteurs indésirables. Whitehaven beach is a 7km stretch of beach on Whitsunday Island, Australia. Whitehaven Beach is known for its white sands. The sand consists of 98% pure silica which gives it a bright white colour. Unlike regular sand, the sand on Whitehaven beach does not retain heat making so it is comfortable to walk bare foot all day through the hot sun. This beach defines nature at its best and gives the greatest sense of relaxation and escape. La Plage de Whitehaven est un tronçon de 7 km de plage sur l'île de Whitsunday, Australie. 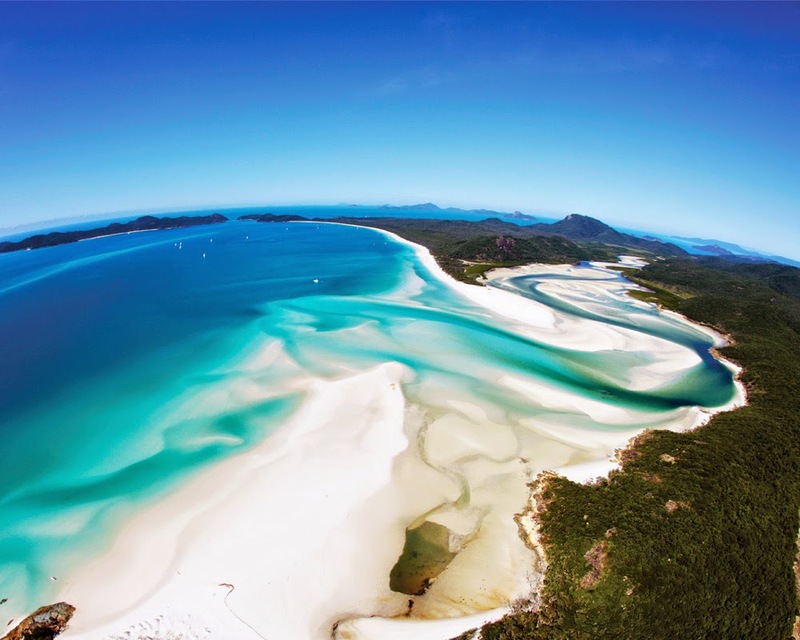 Whitehaven Beach est connue pour ses plages de sable blanc. Le sable est constitué de 98% de silice pur, qui lui donne une couleur blanc brillant. Contrairement au sable ordinaire, le sable sur la plage de Whitehaven ne conserve pas la chaleur de sorte qu'on est à l'aise en marchant pieds nus toute la journée. Cette plage définit le meilleur de la nature et donne une immense sensation de détente et d'évasion. 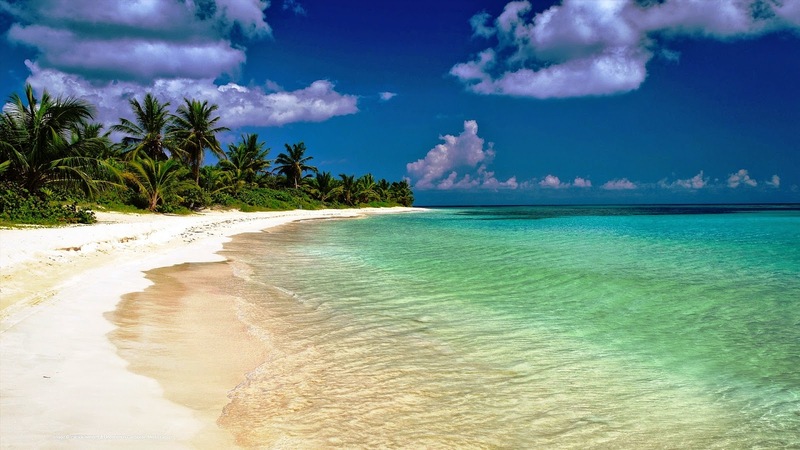 This is a popular beach for honeymooners! 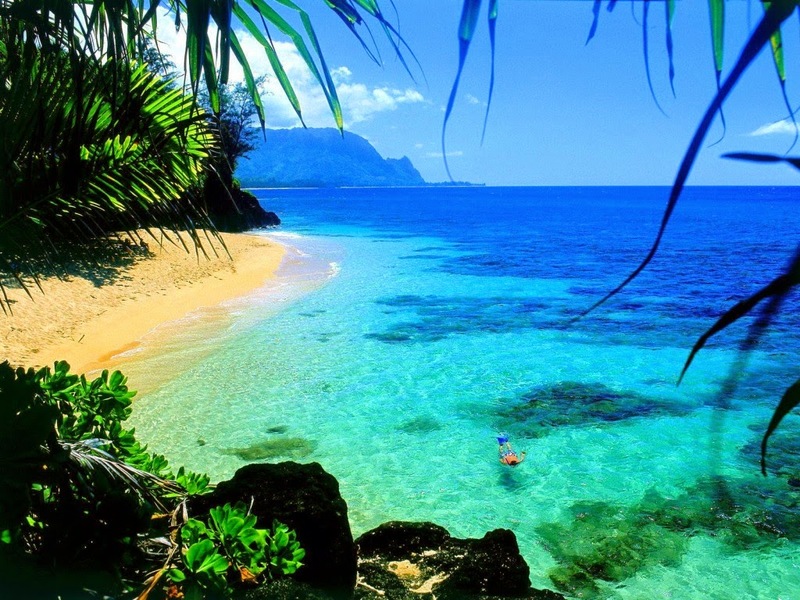 This secluded beach is romantic and beautiful. The pristine blue-green waters, the white sand and green trees all form a colour combination so beautiful - makes you feel like you've landed in paradise. All these colours coming together in one place will be the heaven of any photographer. C'est une plage populaire pour les jeunes mariés! Cette plage isolée est romantique et belle. Les eaux limpides bleu-vert, le sable blanc et les arbres verts forment toute une combinaison de couleurs magnifique - vous fait vous sentir comme si vous aviez atterri au paradis. Toutes ces couleurs qui se réunissent en un seul endroit sera le paradis de tout photographe. The fact that this is Hawaii has already got us wanting to go. Lanikai Beach is hidden away so is quiet and relaxing once you find it. It is described as standing in a postcard. This beach is the image of perfection. Le fait que ce soit Hawaii nous donne déjà l'envie d'y aller. Lanikai Beach est caché, ce qui la rend calme et reposante une fois que vous la trouverez. Elle est décrite comme se tenant dans une carte postale. Cette plage est l'image de la perfection. Which beach will you choose for your next paradise vacation? For more information on private beach booking please contact Easy Beach Booking. Quelle plage choisirez-vous pour vos prochaines vacances? Pour plus d'informations sur la réservation de transats sur des plages contactez Easy Beach Booking. Packages de septembre ! / September packages ! Le mois d'août et les vacances sont peut-être finis mais le soleil est toujours de rigueur sur la Côte d'Azur ! C'est pourquoi Easy Beach Booking vous a préparé une sélection des bons plans du mois de Septembre pour continuer à se prélasser au soleil tout en sirotant des cocktails à moindre budget. Attention offres en exclusivité sur le site ! August is over and holidays may be finished but the sun is always here on the French Riviera! Therefore Easy Beach Booking prepared a selection of exclusive September offers that will allow you to continue to bathe in the sun while sipping cocktails at a lower budget. Warning exclusive offers on the site! Tout d'abord la plage Les Dunes, qui nous propose un transat au prix de 20€, directement réservable au ligne et ce jusqu'à la fermeture de la plage mi-octobre ! Détendez-vous sur la Croisette à tout petit prix et dans des conditions exceptionnelles. En effet, qui dit moins de touristes, dit plus d'espace pour profiter de la Mer et vous détendre dans la ville la plus glamour de France. First the beach Les Dunes, which offers you a sunbed for the costs of 20€. We allow direct online booking until the closure of the beach in mid-October! Relax on the Croisette at unbeatable prices and exceptional conditions. Indeed, As their are fewer tourists, this mean more space to enjoy the sea and relax in the most glamorous French Riviera. Deux transats + 1 parasol à 35€ ou deux transats, un parasol et deux cocktails à 55€. A vous de décider et réserver en ligne et vous n'aurez plus qu'à vous rendre sur votre plage privée pour profiter d'un moment de détente sans pareil! Two sunbeds + 1 umbrella € 35 or two chairs, one umbrella and two cocktails at55 €. Decide when you wish and book online! After this you can then go to your private beach to enjoy a relaxing day soaking in the September sun! Eze Sur Mer est sans conteste The Place To Be: peu connue des touristes, et cachée dans une petite crique entre deux falaises, la plage Papaya Beach est un véritable havre de paix. Découvrez leur offre spéciale : 2 transats + 1 parasol + 2 cocktails + 2 serviettes au tarif de 65€ ! Réglez votre achat en ligne et n'apportez que votre maillot ! Eze Sur Mer is definitely The Place To Be: With a few locals and a hidden in a cove between two cliffs, the beach Papaya Beach is a heaven of peace. Check out their special offer: 2sunbeds + 2 umbrellas + 1 towel + 2 cocktails that costs just 65 €! Purchase online today and bring your swimsuit! Pour finir en beauté, pour les amoureux de la Principauté, profitez d'une journée sur une des plus ancienne et connue plage privée familiale du Larvotto. Le Neptune vous offre una ccueil sympathique et chaleureux et propose le package suivant : 1 transat + 1 parasol + 1 cocktail + 1 plateau de fruits pour 36€ seulement ! To finish off, for lovers of the Principality, enjoy a day on one of the oldest and known private family run Larvotto beach. 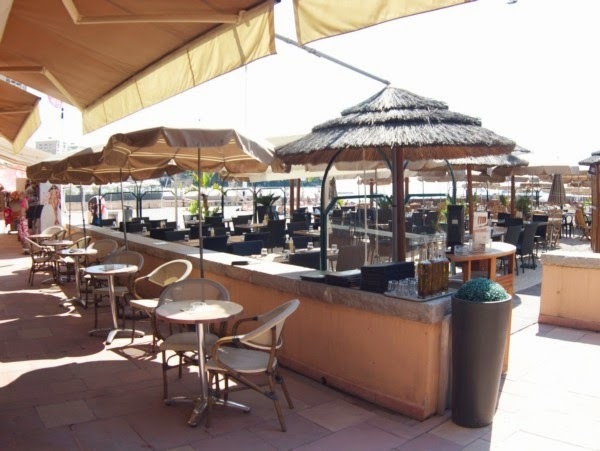 Neptune offers a nice atmosphere and friendly staff that are offering the following package:1 sunbed + 1 umbrella + 1 cocktail + 1 fruit platter for only € 36! Encore plus d'offres sur le site Easy Beach Booking, n'hésitez pas non plus à nous contacter par email beach@easybeachbooking.com ou au 0899490444. More special offers available on Easy Beach Booking, do not hesitate to contact us by email beach@easybeachbooking.com or +33899490444. The diversity of aquatic life and the transparency of the Mediterranean Sea makes Theoule-sur-Mer an ideal place to practice underwater activities. In fact, diving is a very popular activity on the French Riviera. Here you will find many diving schools offering a wide range of courses for all levels. So you can enjoy your time on your sunbed and also explore the Theoule-sur-Mer that isn’t limited by buoys. Théoule-sur-Mer est l’une des plus belles villes de la Côte d’Azur, elle offre une vue imprenable sur la côte cannoise et les îles de Lérins. Cette ville est située au cœur du massif de l’Estérel, ce qui vous offrira la possibilité de pratiquer de nombreuses activités en extérieur, comme des randonnées et des balades en VTT. Ainsi vous profiterez de l’air pur de la campagne environnante pour vous ressourcer. La diversité de la vie aquatique et la transparence de la mer Méditerranée font de Théoule-sur-Mer un endroit idéal pour pratiquer des activités sous marines. En effet, la plongée est un loisir très en vogue sur la Côte d’Azur. Vous trouverez sur place, de nombreuses écoles de plongée, qui proposent un large choix de cours pour tous les niveaux. Afin que vous puissiez profiter pleinement de votre exploration des fonds marins, la ville de Théoule-sur-Mer a délimité un espace grâce à des bouées. Easy Beach Booking vous propose deux plages privées pour une journée de rêve à Théoule-Sur-Mer. Théoule-Sur-Mer è una delle città più belle della Costa Azzurra, offre una vista stupenda sulla Costa di Cannes e le Isole di Lérins. Questa città è situata nel cuore del massiccio dell’Estérel, che vi offrirà la possibilità di praticare numerose attività all’esterno, come delle passeggiate o delle gite in mountain bike. Così potrete approfittare dell’aria pura della campagna circostante! La diversità della vita acquatica e la trasparenza del Mar Mediterraneo fanno di Théoule-Sur-Mer un posto ideale per praticare delle attività sottomarine. In effetti, le immersioni sono un passatempo molto in voga sulla Costa Azzurra. Troverete molte scuole di immersione che propongono una grande scelta per tutti i livelli. Per farvi approfittare pienamente della vostra esplorazione dei fondali marini, la città di Théoule6Sur6Mer ha delimitato uno spazio con delle boe. Easy Beach Booking vi propone due spiagge private per una giornata da sogno a Théoule-Sur-Mer. La Tour de l'Esquillon est une plage privée située dans la magnifique baie de Théoule-sur-Mer. L'endroit est extrêmement calme puisqu’il est niché au milieu des spectaculaires falaises rouges de l'Estérel et des eaux limpides de la Méditerranée. Cette plage privée n'a pas de sable, mais elle dispose d’une plate-forme construite dans la roche, avec des échelles qui vous mèneront directement dans les eaux de la Méditerranée. L’incroyable transparence de la mer à cet endroit rend cette plage privée idéale pour explorer la vie sous-marine très diversifiée de la Côte d’ Azur. Le restaurant de la plage privée La Tour de l'Esquillon, vous servira une cuisine traditionnelle régionale tournée vers la mer. La Tour de l'Esquillon è una spiaggia privata situata nella magnifica baia di Théoule-Sur-Mer. Il posto è estremamente calmo poiché si trova in una nicchia in mezzo a una scogliera rossa spettacolare e le acque limpide del Mediterraneo. Questa spiaggia privata non ha sabbia, la dispone di una piattaforma costruita nella roccia, con delle scale che vi potreranno direttamente nelle acque del Mediterraneo. 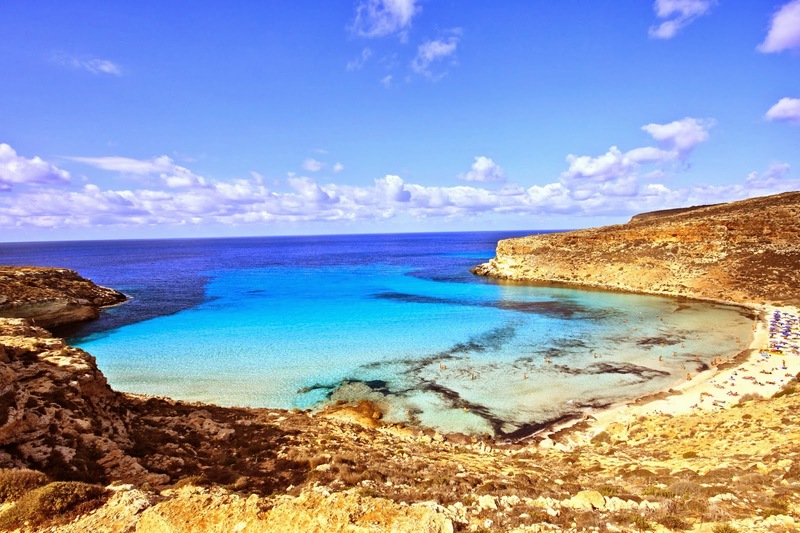 L’incredibile trasparenza dell’acqua in questo posto rende questa spiaggia privata ideale per esplorare la vita sottomarina molto diversificata della Costa Azzurra. Il ristorante della spiaggia privata La Tour de l’Esquillon vi servirà una cucina tradizionale regionale con piatti di mare. Le Marco Polo est une plage privée située également dans la baie de Théoule-sur-Mer. L’endroit vous offre une vue soufflante sur les îles de Lérins. Ici, on se sent totalement dépaysé, j’ai eu l’impression d’être sur une île car tout est mis en oeuvre pour vous en donner l’impression. Quittez le bruit et le monde des grandes villes pour ce coin isolé ou le mot d'ordre n'est rien d'autre que détente et relaxation. Le restaurant de la plage privée Le Marco Polo vous servira tout type de plats pour déjeuner tout en restant les pieds dans le sable. Marco Polo è una spiaggia privata situata nella baia di Théoule-Sur-Mer. Il posto vi offre una vista da togliere il fiato sulle Isole Lérins. Qui vi troverete totalmente spaesato, avrete l’impressione di essere su un’isola in quanto tutto è sistemato in modo tale da assomigliarci. Lasciate il rumore e la gente delle grandi città per questo posto isolato dove la parola chiave è relax. Il ristorante della spiaggia privata Marco Polo vi servirà ogni tipo di piatto per mangiare con i piedi nella sabbia. N'hésitez plus et contactez-nous pour réserver sur l'une de ces plages au 08 99 49 04 44 ou à beach@easybeachbooking ou sur notre site easybeachbooking.com. Notre équipe vous conseillera sur les endroits à visiter et à ne pas manquer ! Non esitare e contattaci per prenotare su una di queste spiagge al numero 08 99 49 04 44 o all’indirizzo email beach@easybeachbooking o sul nostro sito easybeachbooking.com. Il nostro staff vi consiglierà sui posti da visitare e da non perdere! Spend a day on a private beach in Monaco! / Passez une journée de rêve à Monaco ! / Passa una giornata da sogno a Monaco! Monaco is know for its glamour, its annual Formula 1 Grand Prix race and its glamorous nightlife! During the day its nice to relax in luxury and tranquility down at one of Monaco's famous private beaches before you attend an event or go out for the night! These beaches have some extraordinary restaurants serving some of the best food in the French Riviera. You are guaranteed a luxurious day and maybe even some celeb spotting! Monaco est connu pour son côté glamour, son Grand Prix de Formule 1 annuel et sa vie nocturne! Durant la journée, il est agréable de se relaxer dans une luxueuse et tranquille plage privée de Monaco avant de faire la fête toute la nuit ! Ces plages ont de délicieux restaurants qui proposent la meilleure nourriture méditerranéenne de la Côte d'Azur. Vous êtes certains de passer une journée merveilleuse et peut-être de repérer quelques célébrités ! Monaco è conosciuta per il suo glamour, il suo Gran Prix di Formula 1 e la sua vita notturna chic! Durante il giorno è bello rilassarsi nel lusso e nella tranquillità in una delle spiagge private di Monaco prima di assistere un evento o uscire per la notte! Queste spiagge hanno dei ristoranti straordinari che servono il miglior cibo della Costa Azzurra. Ti garantiamo una giornata lussuosa e magari anche la presenza di qualche celebrità! Le Neptune is situated on Larvotto beach, a tranquil corner of the city, ideal for taking a break from the hustle of the city! This beach has been operating for 20 years and is known for its friendly and caring staff. The restaurant has an informal feel to it, and serves up a range of appetising dishes adapted to personal tastes. There is also a large brand of cocktails and ice cream to eat by the water‘s edge. A amazing place to come with family or a large group of friends to get away from the hustle and bustle of the city! They even have a tender service if you are on a boat and wished to be brought to the beach!! Le Neptune est situé sur la plage du Larvotto, un coin tranquille de la Principauté, idéal pour faire une pause éloigné de l'effervescence du centre. Cette plage existe depuis 20 ans et est connue pour son équipe sympathique et attentionnée. Le restaurant sert toute une gamme de plats adaptées à tous les goûts. Ils ont également une grande sélection de cocktails et de glaces à déguster près de l'eau sur votre transat. Un lieu étonnant à découvrir en famille, entre amis ou en couple. La spiaggia Le Neptune è situata sulla spiaggia del Larvotto, un angolo tranquillo del Principato, ideale per fare una pausa staccati dal centro effervescente. Questa spiaggia esiste da 20 anni ed è conosciuta per la sua squadra simpatica e attenta. Il ristorante serve una gamma di piatti adattati a tutti i gusti. La spiaggia ha inoltre una grande selezione di cocktails e di gelati da gustare a bordo mare sulla tua sdraio. Un posto stupendo da scoprire con gli amici o in famiglia! Situated on the tranquil beach at Larvotto in Monaco, La Rose des Vents private beach is a very relaxing place to escape the busy centre of Montecarlo. 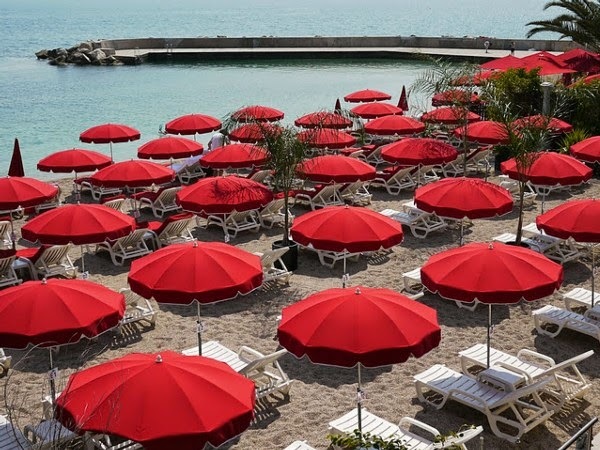 The bright red sun lounger cushions are a contrast to the turquoise blue water of the Mediterranean sea and the fine white sand. Visitors can relax under a parasol or enjoy swimming in the sheltered water. The beach restaurant offers a refined setting to enjoy lunch or dinner by the water’s edge on the French Riviera. It serves a delicious selection of Italian and traditional Monaco food. Située dans le quartier du Larvotto également, La Rose des Vents est une plage privée très relaxante pour échapper au centre bruyant de Monte Carlo. Les transats rouges vifs contrastent avec le bleu turquoi se de la mer Méditerranée et le fin sable blanc. Les visiteurs peuvent se relaxer sous un parasol ou nager dans l'eau limpide. Le restaurant de la plage propose un cadre raffiné pour déguster votre déjeuner ou dîner au bord de l'eau sur la Côte d'Azur. Ils servent une délicieuse sélection de nourriture monégasque et italienne traditionnelle. Situata anch’essa nel quartiere del Larvotto, La Rose des Vents è una spiaggia private molto rilassante per scappare dal centro rumoroso di MonteCarlo. Le sdraio rosso vivo contrastano con il blu turchese del Mar Mediterraneo e la sabbia bianca fine. I visitatori possono rilassarsi sotto un ombrellone o nuotare nell’acqua limpida. Il ristorante della spiaggia propone un quadro raffinato per degustare un pranzo o una cena a bordo acqua sulla Costa Azzurra. Inoltre; una deliziosa selezione di cibo monegasco e italiano tradizionale è servito! Also view our other sophisticated and luxurious private beaches in Monaco such as MIAMI PLAGE, LA NOTE BLEUE or LE MÉRIDIEN BEACH PLAZA. Vedi anche altre spiagge private sofisticate e lussuose a Monaco come la Miami Plage, La note bleue o Le méridien beach plaza. Les plages électroniques à Cannes : un événement musical d'envergure ! / Major music festival in Cannes : Les Plages Électroniques! 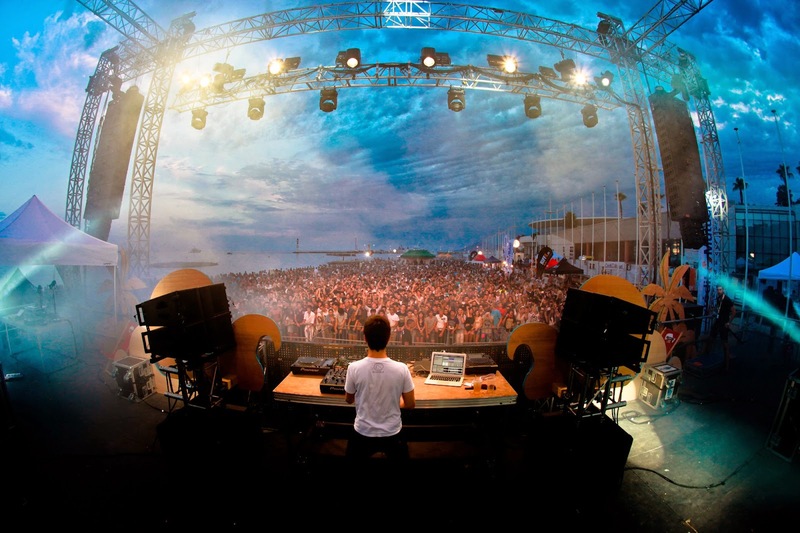 / Les Plages Electroniques : un evento musicale di grande importanza ! Chaque année durant l'été, les plages Electro reviennent à Cannes, transformant la plage du Palais des Festivals en un immense concert. Pour sa 9ème édition, 5 soirées sont prévues entre le 10 juillet et le 14 août. Complètement magiques, profitez de la musique les pieds dans le sable ou dans la mer ! Les Plages électroniques est le seul festival de musique consacré à un public de plage sur la Côte d'Azur pour les fans de musique électro. De plus en plus populaire chaque année, le concert s'agrandit d'année en année. Prenez une journée de repos pour vous détendre sur un transat sur une plage privée de Cannes puis allez vous déhancher sur le dancefloor ! Quoi de mieux pour se préparer à une nuit folle qu'une journée relaxante et luxueuse sur une plage privée! Ogni anno durante l’estate, le spiagge Electro ritornano a Cannes trasformando la spiaggia del Palais des Festivals in un immenso concerto. Per la sua 9° edizione, 5 serate sono previste tra il 10 e il 14 agosto. E’ un evento magico, approfitta della musica con i piedi nella sabbia o nell’acqua! Les Plages Electroniques è il festival di musica consacrato a un pubblico che ama la spiaggia sulla Costa Azzurra. Essendo sempre più famoso ogni anno, il concerto aumenta sempre di più di importanza e di grandezza. Prenditi una giornata di riposo per distenderti su una sdraio di una spiaggia privata di Cannes poi vai a scatenarti sulla sala da ballo! Cosa c’è di meglio per prepararsi a una notte folle che una giornata rilassante e lussuosa su una spiaggia privata!